Solid, well-built seats, but the shoulder straps can be problematic on both the Mini and Mini City. BEST FOR: Bikes with at least 1" inch of clearance on steer tube for mounting. Unflexible, yet sturdy straps also make seat best for toddlers with smaller builds. From the Netherlands, where a large percentage use bikes as their primary source of transportation, BoBike has fine-tuned their products to maximize comfort and usability. With two front-mounted models, optional hand bars, sleep pads, windscreens and storage boxes, the Bobike Mini and the Bobike Mini City can each be customized to suit your needs. From the mounting bracket (the BoBike City and Mini+ use the same one) to the highly adjustable straps, compared to the other front-mounted seats we tested, the BoBike City provided the most comfortable and stress-free ride for both parent and child. If you attempt to install the bracket yourself, please note that there is a slight mistake in the BoBike video above. When remounting your handlebars, be sure to tighten the bolt on the top cap (bolt shown in step one above) before tightening the bolts on the stem (shown in step 2 above). Once the bracket is mounted, the seat is attached by sliding the seat’s two mounting bars through the two holes on the bracket closest to the saddle of the bike. A safety pin in then attached for added security (shown in the video and in the picture below). Although both use a safety pin, the Mini City has additional quick-release bracing that unlocks by pulling a handle on the back of the seat. To remove the seats, simply remove the safety-pin and pull the seats up, the City requires you to pull a handle while the Mini+ lifts straight up. Once removed, unlike the i Bert or WeeRide, the small, unobtrusive bracket can remain on the bike without concern to its rider. The buckling systems on the Mini City is the main selling feature of the seat. While the Mini+’s buckling system is quite standard compared to other brands, the City’s is hands-down the best system on the market. First off, the extra-wide straps with three independent adjusters allow for a comfortable, customized but most importantly, secure fit. Concerns about straps slipping or being pulled down during a ride are also eliminated by the City’s unique buckling system. Instead on buckling between the legs, each strap of the Mini City independently buckles directly into the seat above the child’s shoulders. Petite riders however, may have more difficulty riding with front-mounted bikes seats due to the smaller geometry of their bikes. 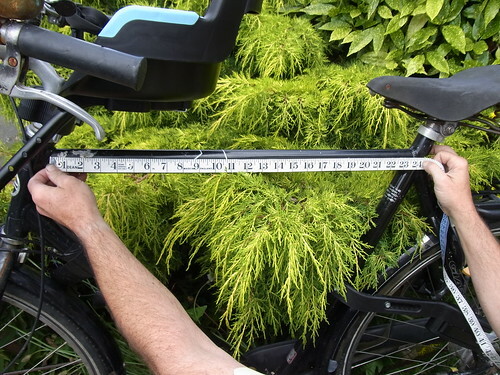 A simple measurement of your bike’s top tube can help determine if you and your bike are suitable for a front-mounted seat. If the length of your top tube (or the distance from the stem to the seat post) is less than 20″, you may have not have enough room to ride comfortably. As a reference, both the Mini+ (shown below) and the City take up 10″ of real estate on your bike. Having ridden with the BoBike Mini City for the past year, several differences between the two became apparent during our rides. While the bike seats look and essentially function the same, there are certainly pros and cons to each. Starting with the seat, the durable foam material of the Yepp (link to my full review of the Yepp Mini) made for easy washing, while the holes in the back allowed for air circulation, preventing sweaty backs on hot days. The BoBike Mini City however, offers slightly more coverage along the sides of the seat as well as a recessed helmet pocket to prevent the seat from pushing up on a young child’s helmet during a ride.